In the village of Kramongmongga, part of the nutmeg fruit is used to welcome visitors. “Christ’s method alone will give true success in reaching the people. The Saviour mingled with men as one who desired their good. He showed His sympathy for them, ministered to their needs, and won their confidence. Then He bade them, ‘Follow Me’” (Ministry of Healing, p. 143). In the jungles of West Papua, Indonesia, villagers harvest nutmeg to be shipped all over the world. In the village of Kramongmongga, part of the nutmeg fruit is used to welcome visitors. 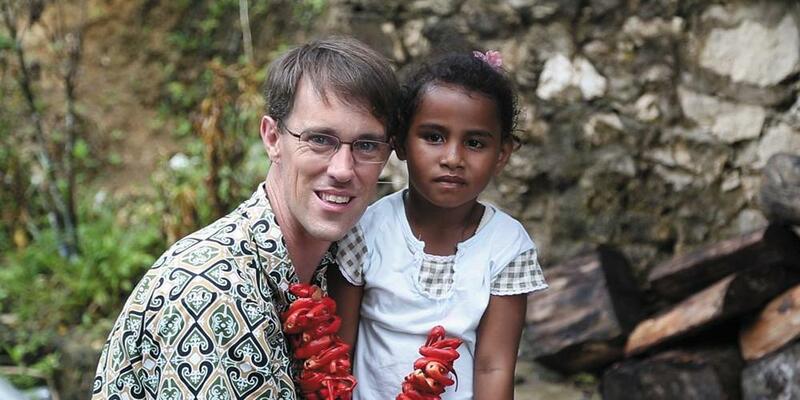 Darron Boyd is a missionary from the United States who has lived in West Papua for several years. He first traveled to Kramongmongga to meet the villagers and become aquainted with their needs. Darron’s goal was to help meet those needs and share the love of Jesus. Every time he visits Kramongmongga, he is greeted with a special nutmeg garland. Darron is spreading the gospel in Kramongmongga by building relationships with people and following Christ’s method of wholistic ministry. Over time, Darron became friends with the village chief, David. When David studied the Bible with Darron, he learned about the Sabbath and began faithfully observing it. David tells everyone in his village about Jesus, and if anyone is interested in learning more, he visits their home to teach them from the Bible. Now many people in David’s village are Seventh-day Adventists. Every Sabbath the congregation meets in a church member’s home to worship. Darron occasionally visits David’s village to see how the church plant is doing. He is excited to learn that the membership is growing and that the congregation will soon need a bigger building to meet in. The rough terrain, world religions, and number of languages in this region make it a challenging area for mission. But through sacrifice and prayer, new churches are being planted. Among many other things, your weekly mission offerings and world budget offerings help support more than 455 missionary families around the world, including Darron Boyd. Please pray for all our missionaries, and thank you for supporting their ministry.